Photograph of several members of the Love family seated on the grass having a picnic. 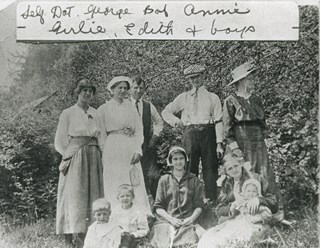 Annie (Love) Whiting is identifed on the right, third from the back. The group is gathered on three sides of a large cloth / blanket with several dishes of food and drink placed upon it. They are situated in a clearing surrounded by trees and bushes. Many of the women and girls are wearing large hats and white blouses with long skirts. Two men situated at the end of the blanket are wearing long sleeve shirts and pants and appear to be eating.